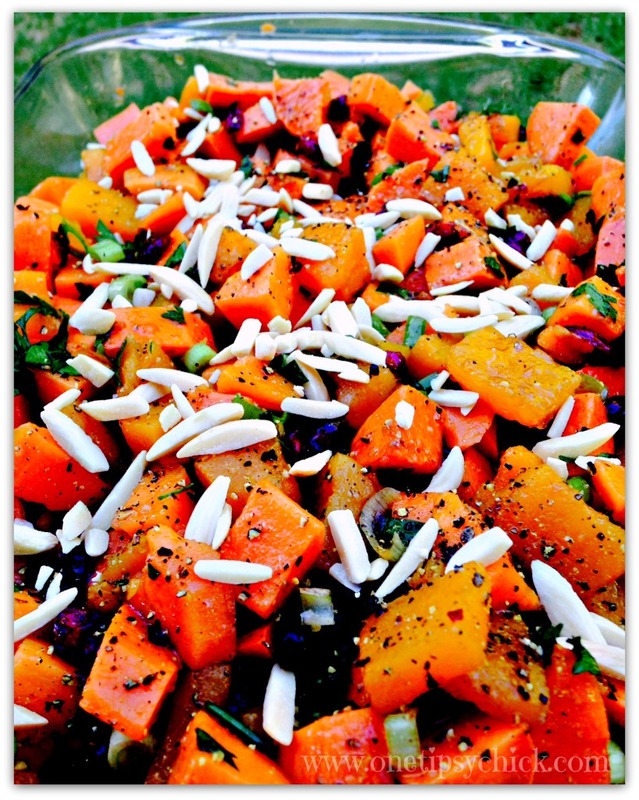 I made this roasted sweet potato salad for a picnic at the lake. It is flavorful, colorful and has a little bit of crunch. You prep it ahead of time, even the night before, then assemble about an hour before serving. It was such a big hit, I’ve decided to make it for Thanksgiving. It is a lighter, healthier alternative to the sweet potato dishes usually served with a Thanksgiving meal. Preheat oven to 400 deg. Place potatoes and squash in a roasting pan and coat with olive oil. Roast for about 30 minutes, or until tender. Be sure to stir about every 10 minutes so the veggies are coated and cook evenly. Once cooked, allow to cool, then refrigerate. I do this either the night before or the morning I plan to serve it, but no less then 3 hours. In a pinch, if you are unable to roast, you can boil the potatoes and squash.I have made it this way before and it was still very good. Once chilled, chop the green onion and parsley. Toss in with the veggies, along with the cranberries. Prepare your dressing, then add to the bowl. Add salt and pepper, then sprinkle the almonds over the top. Allow the dressing to absorb for at least 30-60 minutes before serving. Enjoy! One way I enjoy leftovers, if any, is to spoon some over a green salad, topped with grilled chicken. It makes a fantastic lunch or light supper! I’m definitely going to try this soon. it looks YUMMY! I’m pinning it to my Fall board so I don’t forget! I love that it’s all about the sweet potato with a bit of butternut squash! LOVE me some butternut squash. Totally sounds perfect for Thanksgiving! How are we even so close to it already?! Ack! Pinning! I’m not a big sweet potato gal, but I know my mom & dad would L.O.V.E. this. I think I’ll be making this for them soon! This looks so yummy! Now if I could only get my husband to like sweet potatoes! It took me awhile, but mine eats them now and loved this dish! Love me some sweet potatoes. This looks amazing!! Found your recipe at Tasty Tuesdays at the New Mrs. Adventures. I am one of the hostesses of Tickle My Tastebuds and would love you to stop by and link up this recipe if you have not yet already. I am always looking for a new sweet potato recipe since they are so healthy for you- this seems like it would hit the spot! Thank you for sharing! What a fun recipe! I love it! I would never have thought to eat sweet potatoes in a salad! Beautiful, bright lovely salad. Yum! Great new take on potato salad. Thanks! This looks yummy! I love sweet potatoes. In fact, I love most fall veggies! Can’t wait to try this. Sounds so yummy! Can’t wait to give it a try. Yum! I had to pin and tweet this one! Thanks! Thanks Wendy! I appreciate it! I love this salad for lunch. I enjoy topping a green salad with this too.